Have you ever heard of Blanche Lambert? Me, neither. But that’s the maiden name of Arkansas’ U.S. Senator, Democrat Blanche Lincoln. It’s also the name under which she’s been receiving hundreds of thousands of dollars in federal farm subsidies, courtesy of you, the American taxpayer. Apparently, 11 Members of the U.S. Senate and the House of Representatives have received millions of dollars in federal farm subsidies ($6.2 million! ), while voting–surprise! surprise!–to continue those payments. One House member, Democrat Marion Berry of Arkansas (no, not that Marion Barry), got almost $2.5 million. But the one who seems to be most embarrassed about it–since she won’t use her real name–is Senator Lincoln. Congressional ethics rules allow members who get farm subsidies to vote on the bills that authorize them, on the grounds that the bills affect a general class of people. Some see a problem with that. . . .
Members of Congress must report sources of income totaling more than $200, but most get payments through partnerships or other entities, so it can be difficult to learn which ones receive the subsidies. 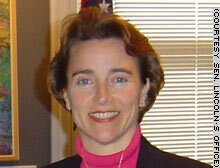 Recipients are searchable by name on www.ewg.org, but, for example, payments to Sen. Blanche Lincoln, D-Ark., are listed under her maiden name, Lambert, at a Virginia address near Washington. Records show Lincoln and her family members collected $715,000 from 1995-2005, the most recent year complete data are available. She said she personally received less than $10,000 a year, and the subsidies ended in 2005 when her land was sold. The proposed $283 billion, five-year Senate farm bill would preserve a system that pays 84% of subsidies to the biggest 20% of the farms, according to the working group, which supports caps on farm payments. Some agribusiness companies receive millions from taxpayers each year, even with crop prices at record levels. One farmer-senator, Republican Chuck Grassley of Iowa, plans to offer an amendment that would cap payments at $250,000 annually. 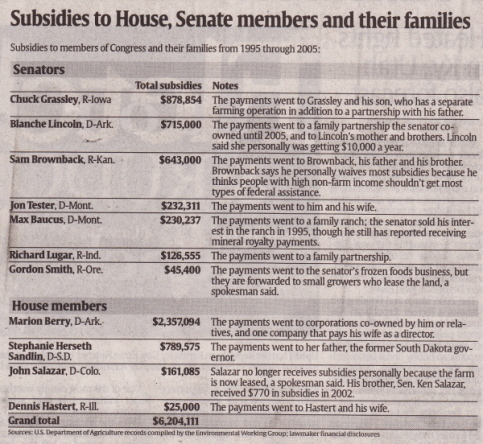 Grassley collected about $225,000 for his corn and soybean farm from 1995-2005. His son took in about $654,000, records show. Neither ever got $250,000 in a year. President Bush wants to end subsidies for anyone making more than $200,000 in adjusted gross income ‚Äî a formula that easily could capture members of Congress, who earn $165,000 per year in salary. Grassley says a payment cap is easier to get done. Tester expressed support for the Grassley amendment, as did Sen. Sam Brownback, R-Kan., whose father and brother are listed as some of his state’s biggest subsidy recipients. Lincoln has opposed similar payment caps, as have the four House members whose families have received subsidies. “It puts my guys out of business,” Lincoln said Monday. Grassley, Brownback and Tester said they support a system of subsidies for small and medium-sized farmers to provide a safety net and protect the nation’s food supply. Only one subsidy recipient in Congress wants to dramatically pare direct payments to farmers: Richard Lugar, R-Indiana, whose family farm received $126,555 from 1995-2005. Lugar backs a plan to cap federal farm payments at $30,000 a year. Rep. Marion Berry, D-Ark., says the system works well. He and his family’s farming interests received almost $2.4 million in federal payments from 1995-2005, records show. His net worth in 2005 was $1.7 million to $6.6 million, according to his financial disclosure statement. “He has firsthand experience of how this really benefits farmers,” said his spokeswoman, Angela Guyadeen. He certainly does. Time to end the federal subsidies for these big corporate-owned and rich-guy farms. This isn’t about saving the family farm. The poorest 80% of farms don’t get most of the money. Why should we subsidize the corporations? End this form of corporate welfare. Debbie, thanks for exposing the hypocricy about the farm bill. I hadn’t seen this anywhere else. thought you’d want the update. Debbie – excellent piece. 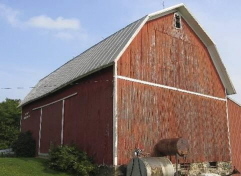 The whole farm subsidy business is a socialist boondogle whereby the well connected vote themselves benefits from the public treasury.